Global readers' passion for original Chinese storytelling reflects the world's interest in fast-growing China and its culture. A special bookshelf named "That's China" has been inaugurated at the Confucius Institute of Barcelona, with the Spanish translations of more than 200 works of Chinese modern literature on display. A corpus of Mongolian language literature containing 120 million words is expected to be completed by 2024, local authorities said Friday. An interactive puzzle-solving game book, Migong: Ruyi Linlang Tuji will be published by the publishing house of the Palace Museum. Chinese Wuxia (martial arts) novelist Shiao Ching-jen died of lung cancer in Los Angeles, the U.S. on Monday. ​A collection of Liu Yida's Beijing-style novels was promoted at a press conference held in Beijing's Ditan Park on Nov. 10. The Chinese version of the Goncourt Prize, the most prestigious award in French literature, will be presented for the first time on Nov. 24 in Wuhan, central China's Hubei Province, according to a press conference held in the city Tuesday. 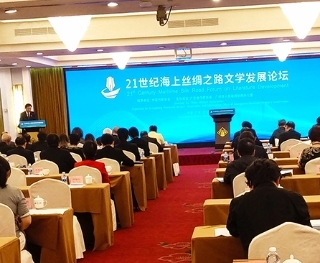 China International Publishing Group (CIPG) called for more literary works highlighting the progress of Belt and Road Initiative (BRI) at a cultural forum held in Guangzhou, Guangdong province, on Monday, 2018. A hand-drawn children's book chronicling Dubai's history was launched in Beijing in late October.